The goal of this workshop is to provide a discussion of these challenges and tools with which to address them. Additionally, we hope to provide students and community members with unique training that is becoming increasingly relevant in today ’s research and media landscape. 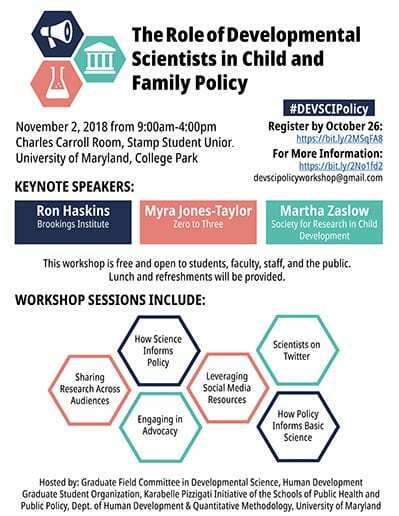 This workshop is geared toward a multidisciplinary audience, as effective engagement in policy is relevant to all child and family scientists. The Graduate Field Committee in Developmental Science provides graduate students an opportunity to plan a workshop on a topic aligned with their interests. Funding will be awarded in order to offset the cost of the workshop. In order to submit a proposal for a funded workshop during the 2017-2018 academic year, please contact Alex D’Esterre at alexdesterre@umd.edu for submission instructions. To see examples of previously funded workshops see below. This one-day workshop took place on March 3rd, 2017 and consisted of five invited talks followed by question and answer sessions and a student poster presentation. The workshop generated great discussion and was very well attended. On March 4th, the Graduate Field Committee in Field Committee sponsored “Roots of Compassion: From Basic Science to Practice”. The workshop was very well attended and fostered great conversation with some of the leaders in the field.